… if I did introduce you to my wife and you [2 words illegible] make the remark that you had had the pleasure of meeting her in Chattanooga? And yet one of our alleged newspapers that has been very busy defending your good name, and painting mine blacker than hell in this community, has the audacity to publish in their Sunday morning edition a statement that my wife became so disgusted with me that she separated with me a year ago. This statement is without any foundation whatever, and an alleged representative of this alleged newspaper had the effrontery (fortunately for him that I was absent) to approach my wife in the hotel parlor on Friday night in the presence of another lady and try to scare her to death with threats, which I would hate to believe met your approval. I wish to say to you, sir, that in any controversy that I might have with you, or any other man, and I become so low and so prostituted that I forget my mother and your mother and our wives, are women, pure, sweet women, of this bright and beautiful southland, and make an attack upon them, I want some one to shoot me as they would a mad-dog. I am really surprised in the bitter attack you have made upon me, when you start that attack by saying I am an irresponsible creature, in other words that I am an insane man. I am indeed surprised that a gentleman of your standing would make an attack of the kind you have made upon me, if you believe me bereft of my reason. There is not money enough in the state of Georgia to hire me, “poor moral pervert degenerate and irresponsible creature” that you have seen fit to call me, to make an attack upon a woman, child or an irresponsible human being. Perhaps though, colonel, you were in a desperate frame of mind over your experience with the dictograph and forgot yourself. If so, you are excusable. In writing to you on Saturday night I misunderstood your witness, Mr. Atchison’s name, it had been told me as Mr. Atherton, and I did not know who your distinguished friend was until Saturday night. Poor Atchison, he started out in Nashville a few years ago with a brilliant future as a young physician of promise, but now he is in Atlanta, having deserted the medical profession, which of course he had a right to do, and is following another avocation, and according to his own statement he has only been in the city since January 1, last past, and as I take it is a friend of yours he is catering to a little newspaper notoriety; in other words he would like for the citizens of Atlanta to know that he has arrived. I haven’t seen this gentleman in fifteen years, but I will explain in a few days to the satisfaction of the public what his grudge is against me. As for your other character witnesses, I would not dignify them with a reply, though I am exceedingly surprised, when you started out in your denunciation of me that you could get 1,000 people to swear that they would not believe me on oath, that you fell 996 short of your number, and I think that this will conform with about every charge and statement that you have made in your great defense. I would suggest that your royal flunky, Tobie, who evidently has got a sore toe over the recent exposure, go to a drug store and buy a corn plaster. If he can’t find one, let him call on the Pinkerton Detective agency to pilot him to the nearest one, and I am satisfied that Mr. Harry Scott would take great pleasure in prompting your royal flunky in his little drama, scene 1, act 1, called “The Mysterious Hunt of the Far-Famed Burns Detective Agency for the Murderer of Mary Phagan.” The only thing that is the matter with Mr. Tobie is that he arrived on the stage too late in the drama, as Lanford and Scott already had the evidence to indict Leo M. Frank, as the action of the grand jury has proven. I read Tobie’s attack on me in your afternoon organ, and I also noticed that he laid great stress upon the fact that he was here for business, pure and simple, provided, of course, that the citizens of Atlanta opened up their purses and responded to his call for money, as the Burns agency, according to him, was not in business for their health. No one who is familiar with their recent past experiences doubts Mr. Tobie’s assertions, but in Mr. Tobie’s call he reminded me of a Pullman porter who had been on a long run all night with only two old maids for passengers, and he knew the tips were scarce, and he was going through the car making a last desperate call for breakfast. 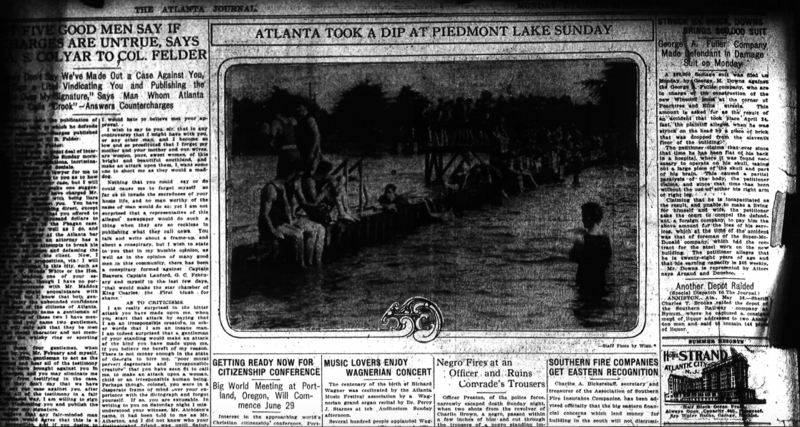 Atlanta, Ga., May 26, 1913.